Yes, this sucker is fully street legal. Aston Martin proudly states the Vantage GT3 is the most powerful road model it’s ever built. With its 6.0-liter V12 producing a grand total of 592 hp and 461 lb-ft of torque, we fully believe the carmaker. All that power is routed to the rear wheels via a seven-speed automatic gearbox that’s been recalibrated for faster shifts and a new magnesium torque tube. Top speed is said to be 185 mph and 0-60 mph will happen in just 3.5 seconds. 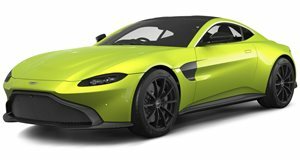 The V12 Vantage S has a top speed of 205 mph, but the GT3 variant is limited by the additional drag caused by the aeros. Speaking of which, the GT3 is lower and wider and features carbon-fiber skin a massive rear wing, front splitter, and that horseshoe graphic, which actually aids in cooling and airflow. Chassis upgrades include a modified suspension with retuned Bilstein dampers and Brembo carbon-ceramic brake. Riding on a set of lightweight 19-inch magnesium wheels, the Vantage GT3 looks outstanding. The interior is decked out with carbon-fiber seats and center console, infotainment system, Alcantara trim, and plenty of leather and exposed carbon fiber. Just 100 examples are planned for production, the majority of which have already been called for.